Dojo has been an Greenwich Village institution since 1973 when it was born out of the Ice Cream Connection on St. Mark’s Place. Shortly after it’s opening Dojo introduced its Soy Burger and Tofu Hijiki Burger and its awesome carrot ginger dressing, all of which remain on the menu today. 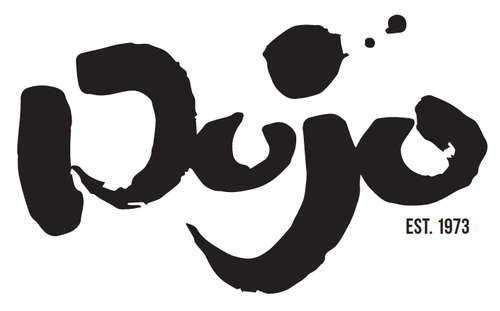 In 1991 Dojo West opened next to the NYU campus, but in 2007 the original location, then called Dojo East, closed due to escalating rent. The original Dojo on St Mark’s was one of the first restaurants I ate in during my first trip to New York City back in the summer of 1989. The Dumplings: Dojo serves house-made vegetable gyoza, house-made pork gyoza and Takoyaki. I tried the pork gyoza and the Takoyaki. 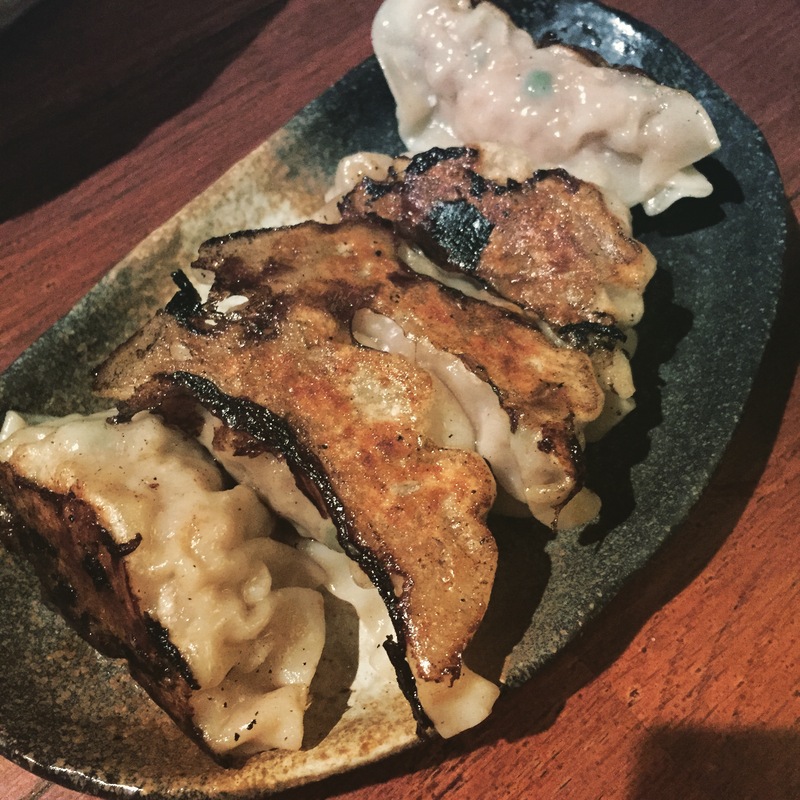 Housemade Pork Gyoza – these terrific dumplings are filled with a mix of ground pork, ginger, cabbage, scallion, miso and sesame oil. The pork was really flavorful and the seasoning were well balanced, Dojo does not seem to be cheaping out on the meat, it tasted like they were using high end pork. The bottoms of the gyoza were seared crispy, close to blackened, producing a slight bitterness that balanced the sweetness of the pork. 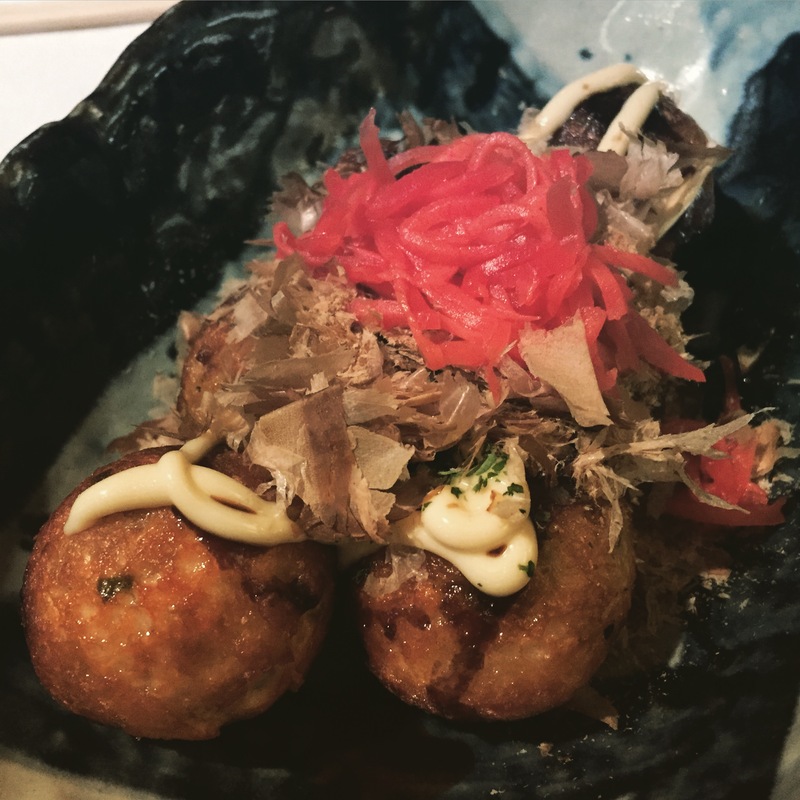 Takoyaki – on the plus side, Dojo’s Takoyaki have more octopus packed into them than your typical octopus ball. But the outer crust seemed burned while the inner layers of batter seemed under cooked – I think they might be running their Takoyaki pan too hot. I was also disappointed with the toppings, rather than big shredded sheets of bonito, the Takoyaki were mainly covered with the bonito dust that gathers at the bottom of a bag of bonito. The Dipping Sauce: While Dojo is known for its amazing carrot ginger sauce, their gyoza dipping sauce is solid, but a little pedestrian. The sauce is a mix of soy and vinegar, a little heavier on the vinegar than the soy. The Location: the remaining Dojo, previously known as Dojo West, is at the intersection of West 4th Street and Mercer Street on the edge of New York University’s Greenwich Village Campus. This entry was posted in Gyoza, Pork, Takoyaki. Bookmark the permalink.